Details of players for both teams will be announced as they are confirmed, with tickets now available by calling 0871 226 6060 or clicking here . Hospitality packages are also available by calling 0191 214 2892. Shearer said: “My knees and ankles are shot so I won’t be a player-manager. I’ll just be in the dug-out, although they might wheel me out to do the kick-off or take a penalty. Les Ferdinand will be my assistant manager and we are on with pulling together the squad. “They’ve got plenty of notice and time to get fit for the game, and looking at Rob Lee recently I think he needs it! But hopefully we should be able to entice as many of the squad from that era as we can, even if the pace is not quite as intense as it was 20 years ago. “Obviously we have had the tragic news of Pavel Srnicek’s death this year and David Ginola has not been too well recently. I have been in touch with David to wish him all the best and hopefully he can be here for the game in whatever capacity, but we are chasing lads to commit and I know Keith Gillespie is doing the same from the Manchester end. 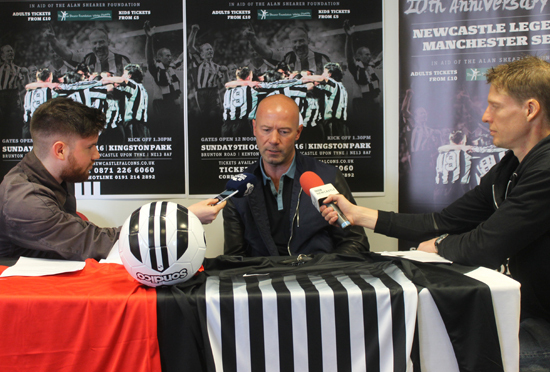 The Alan Shearer Foundation was set up to directly support the Alan Shearer Centre in Newcastle, a highly specialist disability, respite, residential and social provision for people with complex disabilities and acute sensory impairments. The foundation needs to raise at least £250,000 every year to continue to provide free sensory and specialist leisure activities and offer free and subsidised respite breaks for profoundly disabled children and adults.